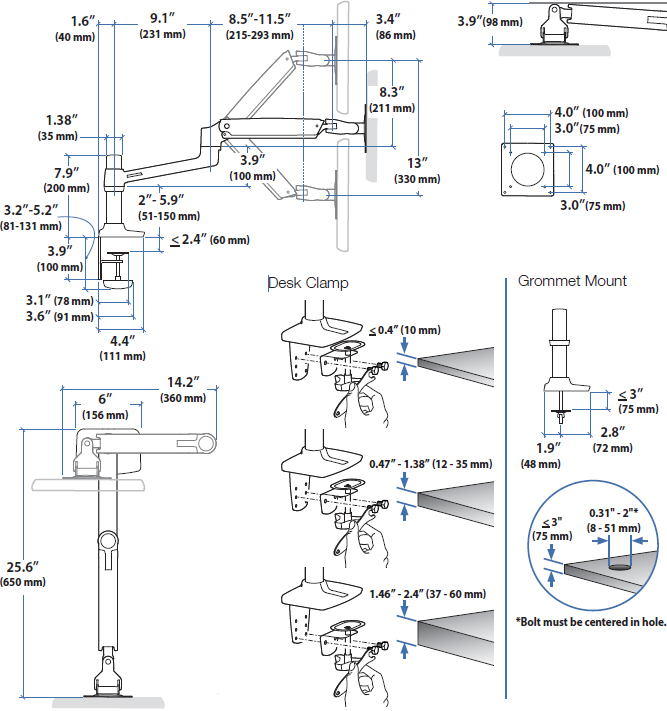 Compatible with monitors up to 32"
Looking for long reach wall mount arm? The EDM-1202D long reach desk mount monitor arm extends 34" out, and has a height range of 13", allowing more flexibility for your ergonomic comfort. Long reach arms help bring content closer when needed, and conveniently fold up when not in use, freeing up space. Monitors 6-18 lbs (max. ), and up to 32" in screen size are compatible with this arm. Install the arm with either a clamp or grommet mount. The monitor can be swung out of the way as necessary, or easily moved up, down, or tilted into a better viewing position. Keep space neat and arranged with this long reach monitor arm that unfolds and extends as needed. This polished aluminum monitor arm has universal applications. Install it in your office to coordinate on content with co-workers, or on the counter of a retail store or library for customers and patrons to look up product availability. Shift the arm to share your screen while helping clients. Perfect for a bank or real estate office. With its sleek, simple look, this extended reach monitor arm is aesthetically pleasing and gives a modern feel to your office or home. This arm also comes with a ten year warranty. The EDM-1202D comes in two models - 1) EDM-1202D with a regular 7" pole and 2) EDM-1202D with a Tall Pole with 13.25" pole. The tall pole model provides an additional distance of 7" along the pole for the arm to be placed. With EDM-1202D and regular pole, the distance from the center of the monitor to the desktop, at the highest position of the arm, is 22". With EDM-1202D-T and tall pole the distance from the center of the monitor to the desktop, at the highest position of the arm, is 27.35". Diameter is 1-3/8". Grip is adjustable on the pole. It can be as low as 2" and as high as 5.9"
Adding this extension to your mount may reduce its weight capacity. When used with the LX Desk Mount Arm (45-241-026), weight capacity is reduced to 18 lbs (8.1 kg); when used with the LX HD Wall Mount Swing Arm (45-268-026), weight capacity is reduced to 36 lbs (16.4 kg).